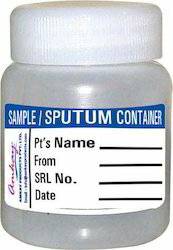 Backed by a team of highly competent professionals, we bring forth a wide range of Sputum Container. Offered containers are manufactured using supreme quality raw material, procured from reliable sources of the industry and are made available to the clients at leading prices in the market. Moreover, these products are widely appreciated for their robustness, sturdiness and compact design and are demanded in a number of hospitals, clinics and other medical areas for the purpose of packing medicines efficiently.